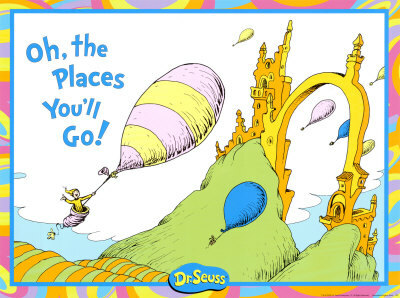 Posts Tagged With: Oh the places you’ll go! Like most people my age (I assume), I resist some new things. Like most people (I assume), I resist some new things. Resistance to new things is pretty common, isn’t it? I mean, it would make sense, that we would resist something unknown. Change engenders both hope and fear. How could it not? I’m not sure whether I’m any more resistant to new things now, than I was when I was younger. That’s not exactly correct. I can remember a lot of things. I’m just not sure how to interpret all that data, regarding this particular question: Am I more resistant to change — now that I’m older — than I was before? My guess, right now, is that I’m more resistant to change if I have some fears about the changes. And the more secure I am in my competence and skills in adapting to change, the less fear I will have, and the less I will resist a change. And, actually, dear reader, I’ve been thinking lately that the trend, for me, is to become MORE secure as I get older. I confess: I like getting older. Whenever somebody asks me, what age would you like to be? I always answer, “This one.” I never name an earlier one. This makes me feel weird, to tell you the truth. Because I hear so much noise, out there, regarding fear of aging. And I understand it. I do! Because the more we age, the closer to (the big D) we are. Actually, I know the reason. It’s because I was born with a heart “defect”, and I got that message loud and clear from people around me: You probably won’t live very long. I am often in the moment. I am grateful for being alive (almost always, although I lose track of that sometimes)). However, I do see My Unusual Life as bringing many more gifts than drawbacks. What the hell is the deal with the title of this post? What does THIS have to do with Tweeting? Well, my intent when I started writing this was to discuss how I have resisted getting on Twitter, and to wonder whether this reflected (1) resistance to change, in general and (2) resistance to a (relatively) new-fangled technology, from me, an older person. But, as Dr. Seuss said ….